Linear Motion, Leadscrews and Nuts - Nordex , Inc.
Nordex offers a large selection of linear motion components: Linear Bearings, Slides, Tables, Guideways, Ball Splines, High Precision Ball, Crossed Roller, Slides and Guides. Linear Bearings are available in Precision Series, High Performance Series, Double Wide Linear Bearings, Flanged, Low Clearance , as Housed Units, and Linear-Rotary Bearings. High Precision Ball and Crossed Roller Slides and Guides are available in many sizes offering a large selection in travel and load capacity. Ball Slides/Ball Slide Assemblies are available in subminiature, miniature and standard sizes with .5 to 4.0 inches of travel and load capacities of 4 to 30 pounds. Other Ball Slide Assemblies are available .75 – 4.00 inches of travel with a load capacity of 15 to 118 pounds. Straight line accuracy .0005/” travel. 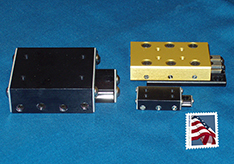 Crossed Roller Slides offered from 1 to 6 inches of travel and load capacities of 50 to 1000 pounds. Ball Splines are available with a Cylindrical Spline Nut, Keyless Block Type, Flanged, also available are Commercial Ball Splines and Rotary Ball Splines. 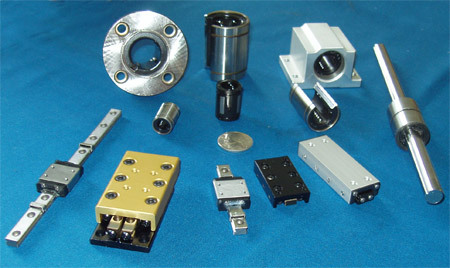 Shaft Support Housings; A wide variety of linear motion slide unites are available: Precision Linear Housings, Block type, Double wide block type, Compact block type, Double wide compact block type, Resin block type, Self aligning, pillow block type housings, Open block type, Clearance adjustable type. Ball Slides / Ball Slide assemblies are available in subminiature, miniature and standard sizes with .5 to 4.0 inches of travel and load capacities of 4 to 30 pounds. 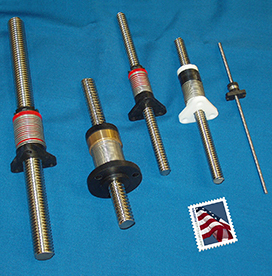 Other Ball Slide Assemblies are available in 0.75 – 4.00 inches of travel with a load capacity of 15 to 118 pounds. Straight line accuracy .0005 per inch of travel. 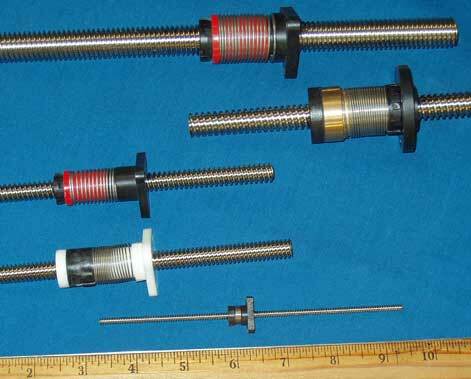 Rolled acme stainless steel lead screws come in commercial and precision quality. Depending on the application, acme lead screws are available in lead accuracies from .003 in/ft with straightness of .01 in/ft to .0001 in/in with positional repeatability of .00005 inches. Anti-backlash lead screw nuts and low drag torque anti-backlash nuts are available from Nordex, Inc. in precision and commercial quality. Commercial quality, anti-backlash, lead screw nuts have a minimum preload of .19 lb to a maximum preload of 11.1lb with internal threads of 3/16-20 to 5/8-10, and are manufactured in Turcite® X Engineered Thermoplastic material. Over 25 different configurations are offered with other sizes available upon request. Please, contact Nordex for additional information. Precision quality, low drag torque, anti-backlash nuts are manufactured in polyacetal, engineered plastic including an integrally molded flange. The drag torque in the mini series nuts is .5 oz-in while the light, medium and heavy duty nuts have a drag torque of .5-2 oz-in to 3-7 oz-in, 1-3 oz-in and 2-6 oz-in to 3-7 oz-in respectively, with load capacities from 5 lb to 350 lb. Rolled Stainless Steel Lead Screws are available in commercial and high precision quality with lead accuracy from .003 in/ft with straightness of .01 in/ft to .0001 in/in with positional repeatability of .00005 inches. In addition to standard lengths of 6, 12, 24, 36 and 48 inches, lead screws may be ordered up to 12 feet long (up to 8 feet with Teflon® coating available in precision quality). Competing with ball screws and ground lead screws, costs for these units are dramatically lower while still providing high accuracy, long life, quiet operation and very low drag torque. Anti-Backlash Nuts from Nordex, Inc. are self wear compensating, low frictional drag nut with high axial stiffness & unsurpassed positional repeatability. 1/4 to 3/4 inch Nominal Screw Diameter Precision Quality Anti-Backlash Nuts. For light to medium loads.